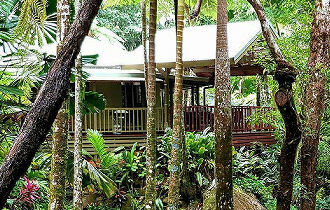 Daintree holiday home is an open plan pole home with views from all rooms of the rainforest and the stream. Size: 215 m². 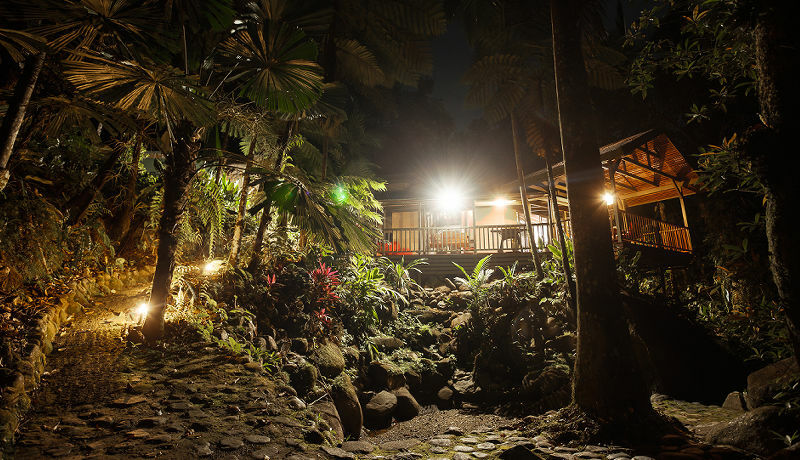 With large, screened windows and doors, the house can remain open to capture the breeze and sounds of the waterfalls and the Daintree rainforest. Fans throughout keep the house cool. A large indoor day bed for those lazy afternoon naps. Basic indoor dining area. 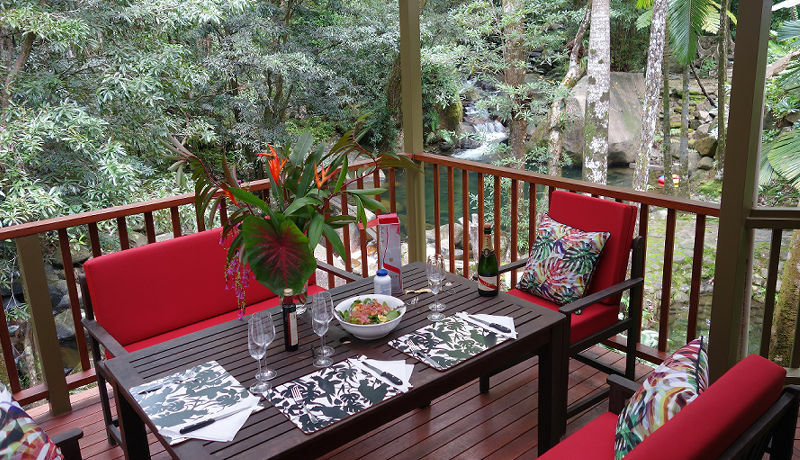 Most people prefer to dine on the verandah with the views. A variety of board games, puzzles, books, DVDs, CD's are provided for your enjoyment. We also provide a natural bamboo speaker, which will amplify music saved on your smart-phone beautifully. 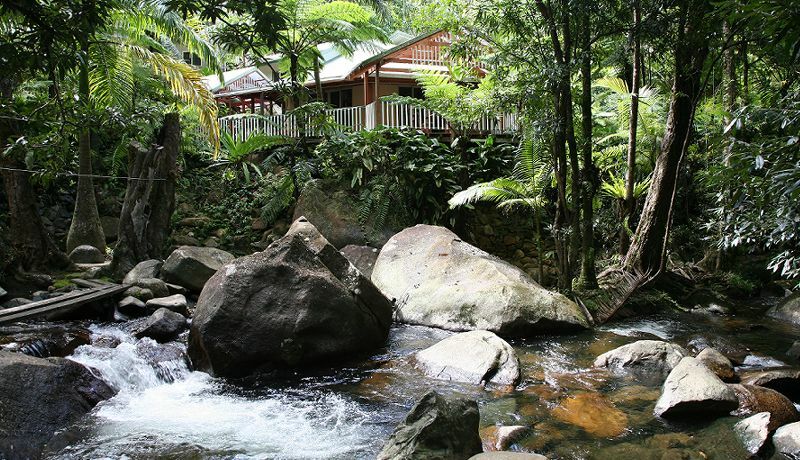 There is no internet access or mobile phone range - part of the beauty of Daintree Secrets. You can truly "unplug" and relax. A phone is provided so you can make local calls to book tours and dinners etc. You can receive calls. The number will be provided to you on booking. Convenient parking on a large flat area beside the house. Baby sitting and a massage by the pool can be arranged for you with prior notice. There are three bedrooms. 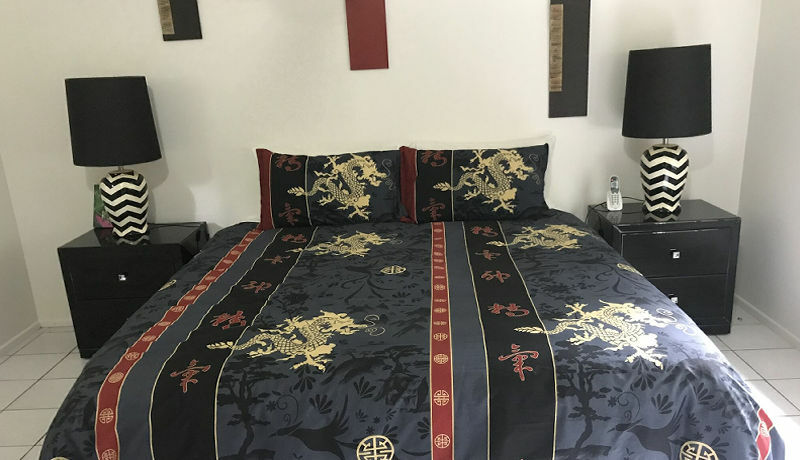 The main bedroom is on the top floor and has a luxury king size bed purchased from the Starwood group of hotels, built in robes and and bathroom. Views out to the rainforest. 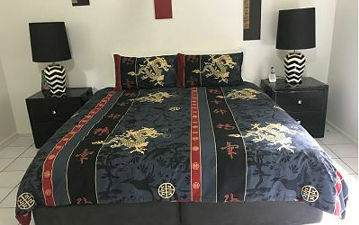 The second bedroom has the same king size bed and drawers for storage, with views over the rainforest. 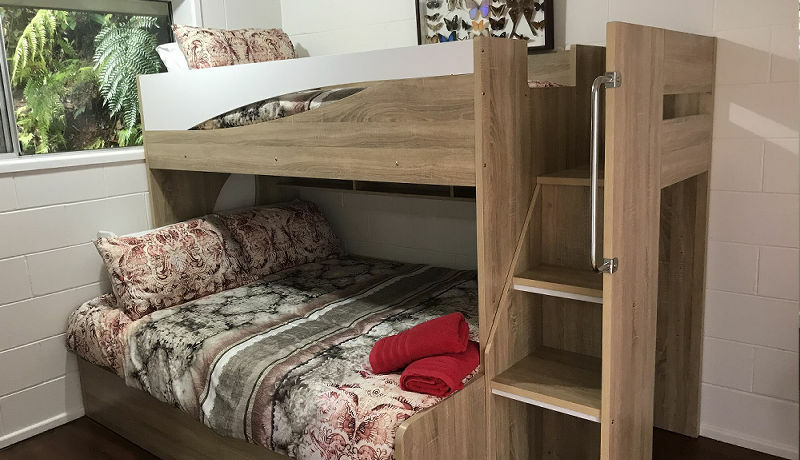 The third bedroom is on the ground floor and has two single beds and a rollaway bed for an extra child. It also features built in robes The main bathroom is situated beside this bedroom. All rooms have ceiling fans and are lovely and cool at night. 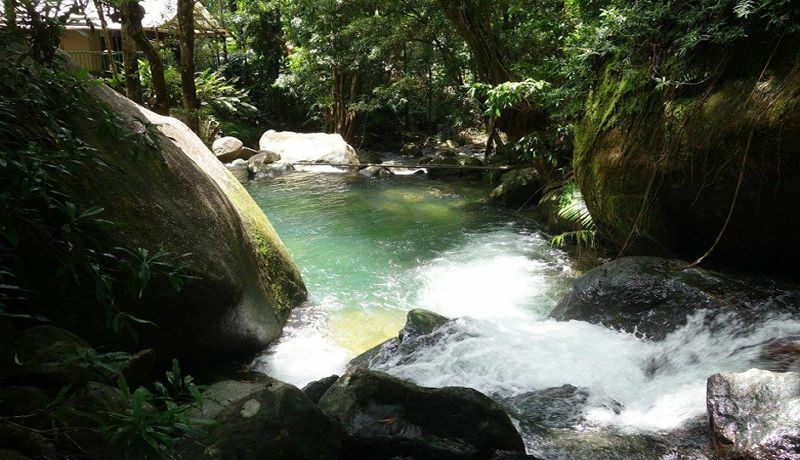 All linen is provided, including beach towels for swimming in our lovely natural swimming hole. The kitchen is fully equipped with full sized fridge/ freezer and ice-maker, gas stove, oven and a microwave. Cutlery and crockery etc for 7 people is included. We have provided everything you need to cook up a storm during your stay. We provide basic pantry items – Daintree tea, coffee, sugar, salt, and pepper grinders, extra virgin olive oil, balsamic vinegar, paper towels, mosquito coils and more. 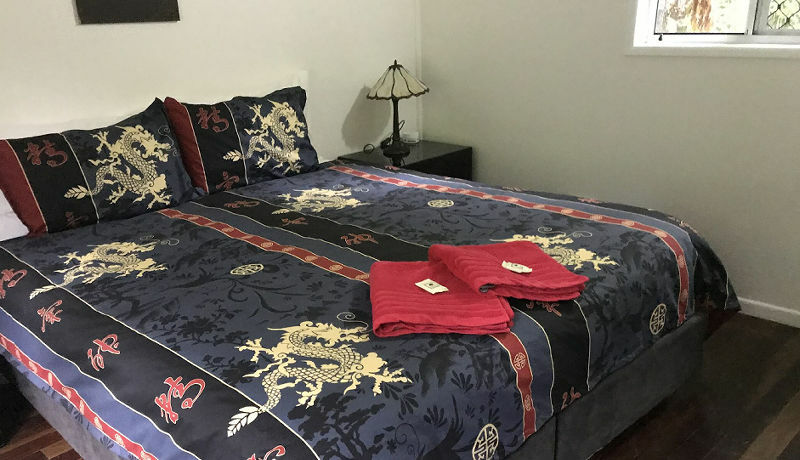 Unless your stay is 2 or 3 nights, most people self cater and plan on eating out a couple of times during their stay. 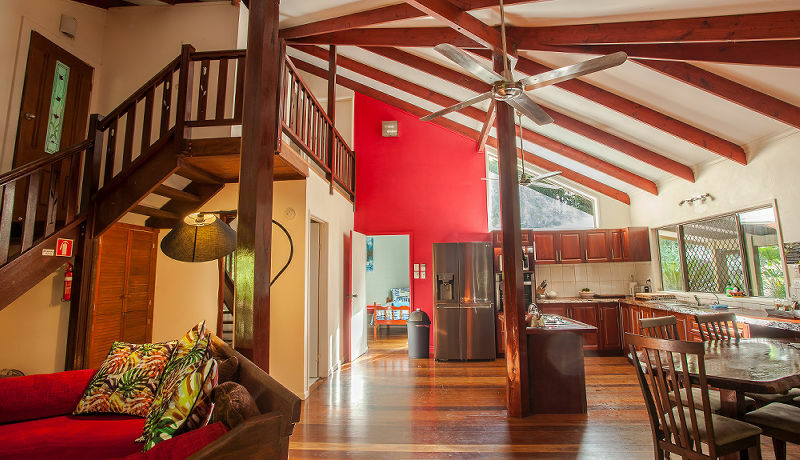 The kitchen has beautiful views of the rainforest and out over the stream and waterfalls. 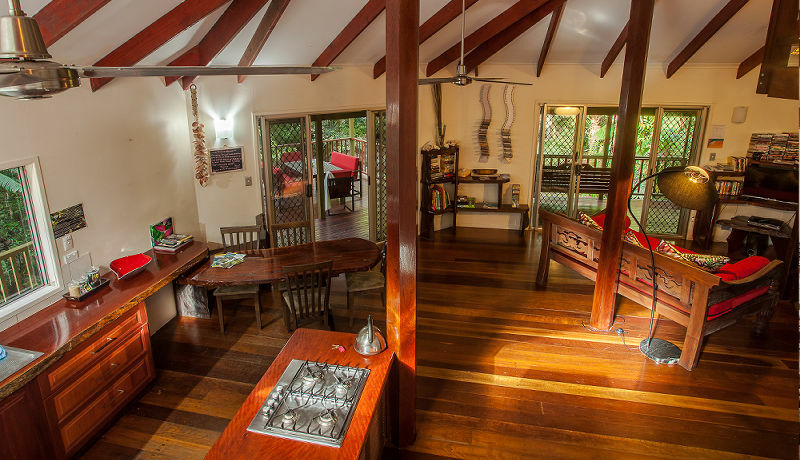 The verandah is where you will probably spend most of your time. 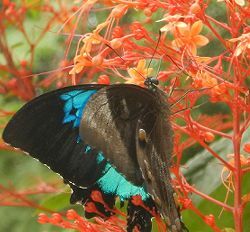 The prefect place for bird watching and enjoying the endless parade of Ulysses butterflies and the stunning Cairns Birdwing butterfly. 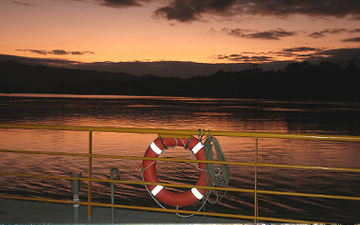 Is long and wide with spectacular views of the rainforest and waterfalls. There is also a quaint hanging swinging Love Seat facing up-stream, The perfect place to read a book or just watch the butterflies. 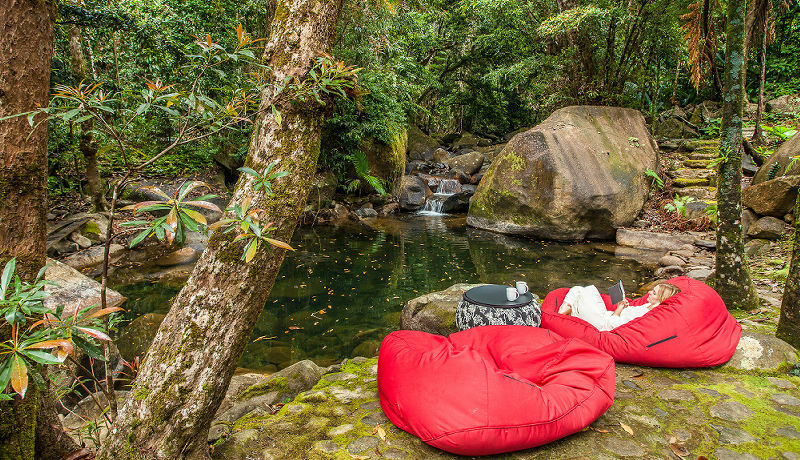 2 double size “Ambient Lounge” beanbags provided to either laze around on the verandah, with a book or for a snooze, or take down by the swimming hole for a lazy day by the pool. A comfortable outdoor table and chairs seats 6 easily. A modern Weber barbeque makes for perfect alfresco cooking and dining. The verandah has gates to prevent small children wandering down to the swimming hole. 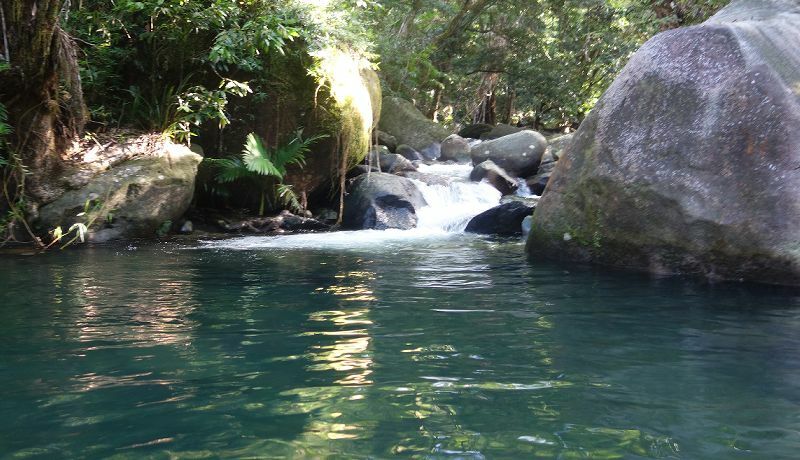 Swimming is divine as the swimming hole is sunny and the water is crystal clear. 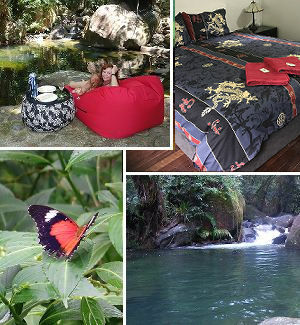 Dive in and swim up to the waterfall and enjoy a back massage. 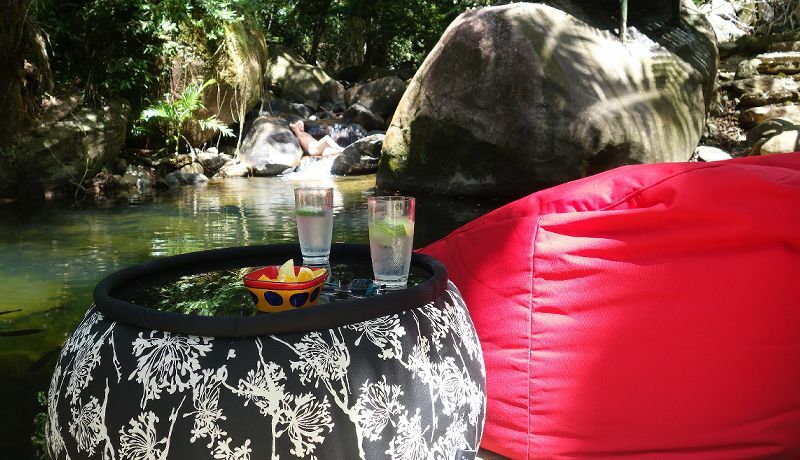 Relax in the shade on one of our luxury double bean bags and while away the day with a good book, or just watch the butterflies! 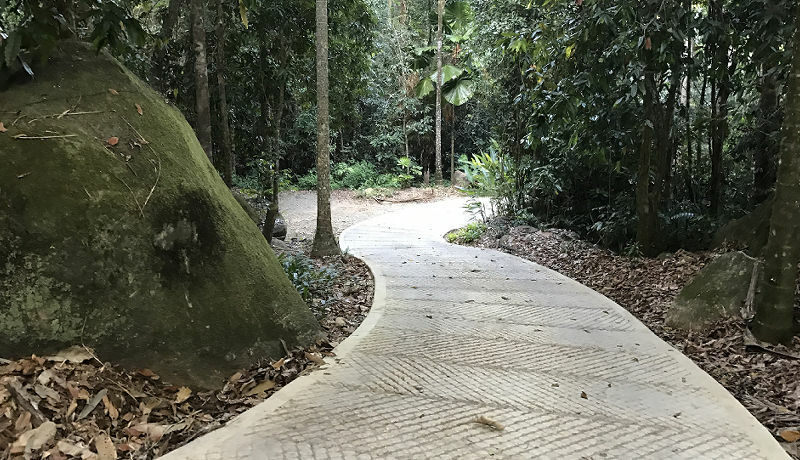 This is truly a Daintree Rainforest paradise!